Located between Jordan and Israel, the Dead Sea Region is one of the most geologically fascinating parts of the world. The Dead Sea region is not only beautiful, it is a unique center for healing that is recognized worldwide for its healing properties. The Dead Sea is located on the Jordan Rift valley, a 4,000-mile fault line in the earth’s crust, 420 meters below sea level. The Jordan Rift Valley was created by the Dead Sea Transform. The Dead Sea Transform is a series of faults in the Earth that form the transform fault boundary between the African Plate and the Arabian Plate. The Dead Sea is a pull-apart basin, meaning that it is a structural basin where two faults overlap, which causes the basin to sink down. The Jordan River is the only major water source flowing into the Dead Sea, although there are small springs under and around the Dead Sea that form pools and quicksand pits along the edges. Although there are rivers that flow into the Dead Sea, there are not any rivers that flow out of it, which helps to maintain its saltiness. The climate is unusually warm and sunny year-round, in the summer time to average temperature at the Dead Sea ranges from 90 and 102 °F , and the winter average temperature ranges from 68 and 73 °F. The area has extremely low humidity, combined with high temperatures, this leads to an extremely high rate of evaporation. When the water evaporates it leaves behind a high concentration of minerals and salt in the lake. The awe-inspiring region surrounding the Dead Sea is breathtaking. Rainfall barely reaches 2 inches per year in the southern part of the lake, because the lake is located in what is known as a “rain shadow”; the nearby Judaean Mountains act as barriers against low-pressure fronts approaching from the West and from the global desert belt. The Dead Sea region is the most mineral-rich area in Israel. 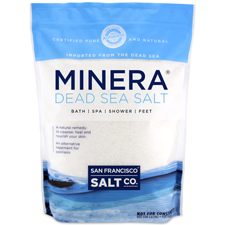 All ocean salt contains minerals, but the salts of the Dead Sea contain a much higher concentration of minerals than other salts - such as magnesium, bromide, zinc, iodine, potassium, calcium, and many more. Sulfur is also found in the region between layers of marl rock and gypsum deposits, formed largely due to the unique climate in the region. These minerals are naturally occurring in the human body and are crucial to many processes, and therefore need to be replenished regularly as they are lost. Mount Sodom, a hill along the southwestern part of the Dead Sea in Israel, is a beautiful and somewhat strange natural structure, rises 230 meters above the level of the Dead Sea and holds roughly a billion tons of pure salt. Mount Sodom looks like a giant block of salt (and, it kind of is). It sat at the bottom of the Dead Sea and was lifted out over time by little earthquakes. The mountain has been sculpted over thousands of years by wind and by water, and continues to be shaped today. This crazy looking mountain isn’t all it appears to be – inside, there are numerous tunnels and caverns. Although the weather here is always warm and temperate, it’s always chilly inside the caverns – even in the summer. There are constant drafts of air that whisk away the dampness that seeps through the walls of the mountain, lowering the temperature year-round. There is an amazing number of caves and tunnels, some hundreds of feet long. This points to an interesting historical conclusion: the mountain must have been hit by huge amounts of water, over and over again. Only the largest deluges of water could have led to the formation of so many intricate passageways and rooms within the mountain.